Cutting compounds, polishing compounds, Aqua Buff, rubbing compounds, buffing compounds. Applying Aqua Buff products page shows how to use these products. Contact us for samples. Find a complete selection of compounding and polishing pads on our Buffs for 3" and 5" pads and Buffs for 7½" pads pages. • do not contain solvents, waxes, oils, or polymers that obscure the true surface: except for Aqua Buff One-Step, that is a solvent-based compound. Fast cut compound, off-white color, used for aggressive removal of 320 to 600 grit sanding scratches or heavy oxidation. Great for use on hard gelcoat: grit allows elimination of deeper scratching. Can be too aggressive on soft surfaces such as Duratec primers. Better for polishing white gelcoat than the 1000-W compound listed below, and works a bit faster than the 1000-W. This compound takes out sanding scratches quickly but will leave some swirl marks. Please call for freight prepaid price on 55 gallon drums. Fast cut compound, blue-green color, designed to remove heavy oxidation and sanding scratches. Less aggressive than the 1000-F listed above. Great for buffing soft products like the Duratec primers. Not recommended for use on white projects due to the color of compound. Can leave a blue haze on oxidized gel coat or white gel coat. But is easier to see on some other surfaces. This compound takes out sanding scratches quickly but will leave some swirl marks. Please call for freight prepaid price on 55 gallon drums. The most aggressive cutting compound. Used when polisher does not want to use a spray bottle to mist part while buffing. Rapidly smooths and polishes gelcoat and composite patterns, plugs, masters, and product molds. Removes scratches and cleans FRP parts, metals, and painted surfaces. Apply Tuff-Stuff in three (3) quarter-size spots over a 1' x 3' area. Use a rotary buffer less that 2500 RPM to prevent surface burning. Use wool or wool-blend pads. Surface should look wet. If not, apply more Tuff-Stuff. Buff until haze is eliminated. Repeat process to eliminate scratches from exceptionally hard surfaces. 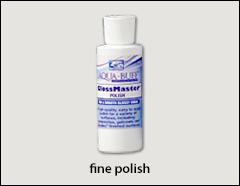 Follow with Aqua-Buff GlossMaster Polish for the ultimate shine. Great polish for removing routine oxidation and compounding swirl marks. Removes 800 grit and higher sanding scratches from gel coat. Creates a great shine on gelcoat or Duratech. Used whenever a high gloss, defect free shiny finish is desired. Does not leave a haze. 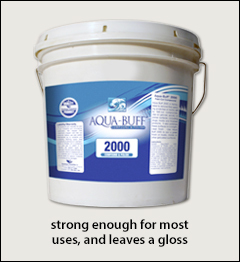 Aqua Buff 2000 is a versatile product strong enough for most uses. When used with a foam pad, this is a good clean-up polish. Please call for freight prepaid price on 55 gallon drums. A fine polish in a black or white color, to create the best finished surface. Black color is used on black tooling to hide minor porosity and pin holes. GlossMaster is a soft density foam that applies easily with a cotton or foam pad. 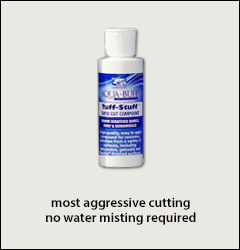 Used when polisher does not want to use a spray bottle to mist surface before buffing. This is a chemical cut, 95% gloss, that leaves a fine glossy surface. This is a solvent-based, one-step compound and polishing product that requires no water misting, unless it dries out. Designed for lighter color surfaces such as boat hulls or shower enclosures. 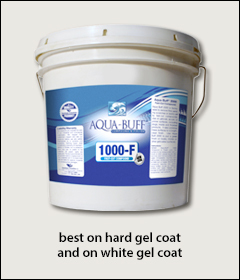 Aqua Buff One-Step works at getting out 800 to 1,000 grit scratches in gel coat, while at the same time providing a glossy finish. Not recommended for tooling gelcoat. Please call for freight prepaid quote on 55 gallon drums, our item number J1763.